During the 18th century Komárom experienced many natural disasters including floods, fires, earthquakes, and cholera and plague epidemics. 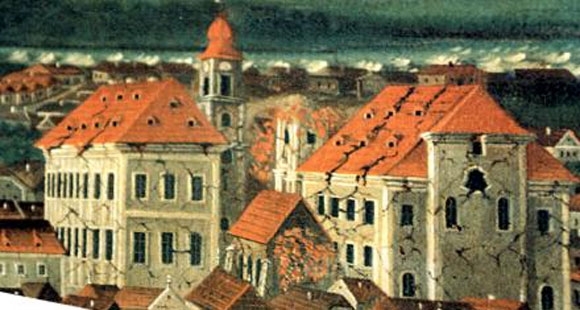 Most notable of these natural disasters were the two earthquakes that completely destroyed the town in 1763 and 1783. Despite these calamities, Komárom continued to be an important center for trade and crafts until the middle of the 19th century. Beginning in the early 19th century, the fortifications surrounding Komárno underwent extensive reconstruction. The reconstruction was interrupted by the Hungarian Revolution of 1848. Komárom played a significant role in the revolution, remaining the last bastion of the Hungarian resistance against the Austrians until 1849, when the fortress and town were finally surrendered. This was during the lifetime of 5th Great-grandparents Gergely Édes and Eva Gyorgy and their children Judith, Susanna and István who lived in nearby Madár. This entry was posted in 1700s, 1760s, Austro-Hungary, Édes, Genealogy, Komárom, Madár, Slovakia and tagged Earthquake, Gergely Édes, Hungarian Genealogy, István Édes by edesorban. Bookmark the permalink.